The Obama administration is telling us that the unemployment rate in the United States has fallen to 5.1 percent, but does that number actually bear any resemblance to reality? On Friday, news outlets all over America celebrated the fact that the U.S. economy added 173,000 jobs in August. We were told that the unemployment rate has fallen to a seven year low and that wages are going up. So everything must be getting better for the middle class, right? After all, isn’t that what the official numbers are telling us? The unemployment rate fell to 5.1% in August, the lowest since April 2008. This was lower than forecast, and put the measure in the middle of the 5.2% – 5.0% range the Federal Reserve considers to be “full employment.” The economy added 173,000 jobs, below the expectation for 217,000, although August payrolls are usually revised higher. We also saw some wage growth, with average hourly earnings rising 0.3% month-on-month, and 2.5% year-over-year. The payrolls gain for July was revised up to 245,000 from 215,000. But do we actually have anything close to “full employment” in this country? Now for the plunge in the unemployment rate. That comes from the household survey. The fact is that 220,000 more Americans entered the work force in August. According to this survey, 196,000 more Americans were employed. In the real world this would result in the unemployment rate going UP. Not in the Bizarro world of the BLS. They expect the peasants to believe that 261,000 Americans, of their own free will, voluntarily left the workforce in August because they don’t need a job to pay the bills, feed themselves, and keep a roof over their heads. The idiocy of this ridiculous assumption is breathtaking to behold. Only an Ivy League educated economist, CNBC shill, or complete and utter moron could believe this drivel. At this point, the percentage of Americans that are actually considered to be “participating in the labor force” is the lowest that it has been since 1977. 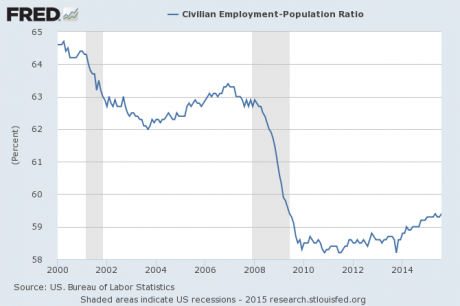 Personally, I believe that the civilian employment-population ratio provides a much more accurate picture of the employment situation in this country. It is a measure of the percentage of the working age population that actually has a job. Does that look like an “employment recovery” to you? It sure doesn’t to me. According to John Williams of shadowstats.com, if honest numbers were being used we would actually have an unemployment rate of 22.9 percent in this country. But if the mainstream media reported that number, everyone would be talking about a “Great Depression” and we would all be complaining about what a horrible job Obama was doing. How can that be possible if we are close to “full employment”? In a recent article on the Economic Collapse Blog, I explained that 46 million Americans used food banks in one recent year, and that lines start forming at some U.S. food banks as early as 6:30 in the morning because people want to get something before the food supplies run out. No, economic conditions are definitely not “good” in this nation. We are being told lies by our politicians and by the mainstream media. The numbers simply do not match what is going on in the real world. They are sleeping in front of the Empire State building, sprawled in front of the doors of Macy’s, and panhandling outside Grand Central. New York is in the grip of a homeless epidemic so bad that it has raised fears of the city slipping back into the disorder of the 1970s and 1980s. The city’s police chief this week said that as many as 4,000 people are now sleeping rough in the city, in a crisis which even the city’s ultra-liberal mayor has finally acknowledged after months of denials. Police officers have identified 80 separate homeless encampments in the city, 20 of which are so entrenched that they have their own furniture, while its former mayor Rudolph Giuliani has spoken scathingly of how his successor is failing to keep order. Robert Kiyosaki, the best-selling author of “Rich Dad, Poor Dad“, recently told Newsmax that the “global economy is in a collapse right now”. And he is right. Things are getting worse in Asia, in Europe and in South America. Things are also getting worse for the U.S. economy. The “employment recovery” that we have already seen is all the employment recovery that we are going to get. From here on out, millions upon millions of American workers are going to be losing their jobs and the suffering in this country is going to be off the charts. So don’t fall for the lies that Obama and his minions are telling you. All you have to do to see the truth is to open up your eyes and look at what is happening all around us.